Ambur in Tamilnadu has more biryani hotels per capita than any other city in the world. What makes Ambur mutton biryani what it is? The legend has it that the mutton biryani was introduced to the Arcot royals through their connection with the Hyderabadi Nizams. Sir Hassan Baig, a cook himself for the Nawab at the Royal palace of Arcot made this biryani regularly for the royals. Later in the years, his son Kurshid Baig started to spread the delicacy by selling this biryani over a bicycle. That’s how the famous Star Briyani hotel was born. Note that they spell it as BRIYANI and not Biryani. They have been doing this since 1890. 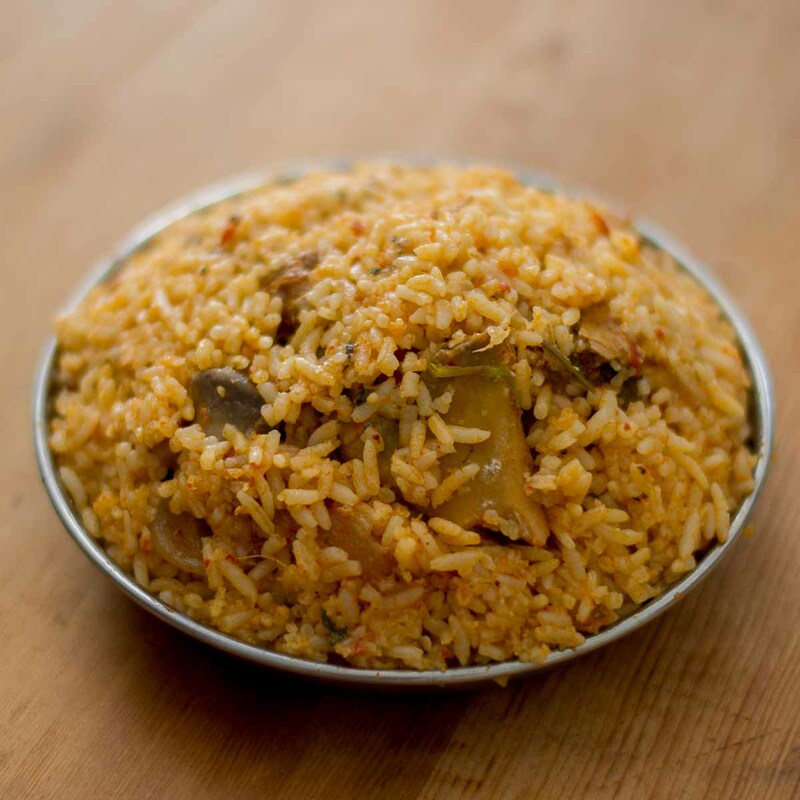 Star Briyani recipe has become a tradition that is continuing now for 4 generations. I have adapted this recipe based on a lot of information gathered from videos and articles featuring Mr.Ahmed and Chef Barkathullah of Star Briyani Hotel in Ambur. 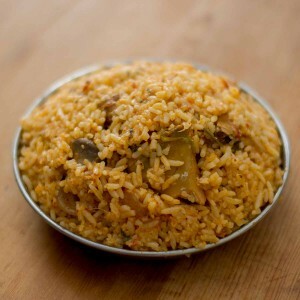 What makes Ambur Briyani (Biryani) unique? He says Ambur mutton biryani is very light on the stomach. Its easily digestible when compared to the other masala laden and fat laden mutton biryani. Here is how to do an awesome Ambur mutton biryani adapted to be made in a home kitchen. We need to make 3 pastes. Garlic paste, ginger paste and chilli paste. Grind all the ingredients in a blender/ mixie separately to a very smooth paste. Add very little water while grinding. Set aside. 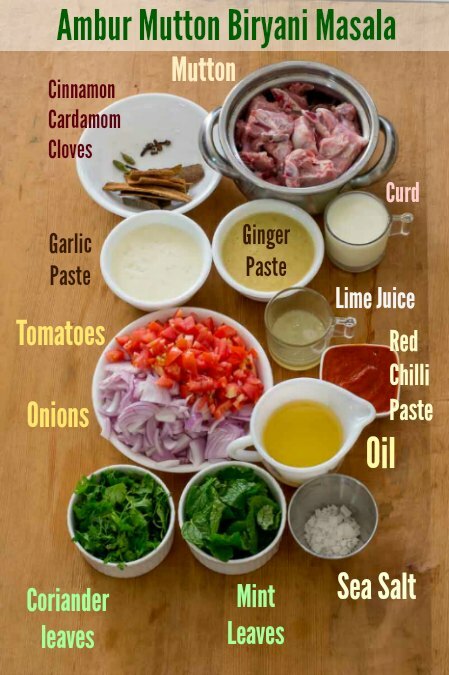 Here are the other things that you will need for making the mutton gravy for the mutton biryani. Soak the rice in lots of water. Set aside. Heat oil in a pan and add a table spoon of curd. The reason for adding little curd in the oil while making this mutton biryani is that it takes away the imperfections if any in the oil. Who am I to question this age old tradition that they have been following since 1890. So add a tablespoon of curd to the oil. Add in the Cinnamon, cloves and cardamom. Fry for 10 seconds. Add in the garlic paste. Fry for 2-3 minutes on medium flame. The ginger and garlic are added separately as garlic takes more time to fry. Ambur people feel that the flavor of the mutton biryani comes from the ginger and for that to happen, garlic should be fried well. Otherwise garlic will overpower the ginger. Now, add in the ginger paste. Fry for 2-3 minutes until the raw smell of the ginger goes off. Add in the chilli paste, mutton, the mint and coriander leaves, chopped onions, tomatoes, sea salt, curd and lime juice. Add in a cup (250 ml) of water. Mix well to combine. Cover and pressure cook everything for 10-12 whistles on medium flame. Switch off the flame and wait for the pressure to release naturally. Bring a pot of water to a boil and add in the soaked rice. Add in the salt. Cook until the rice is half done. 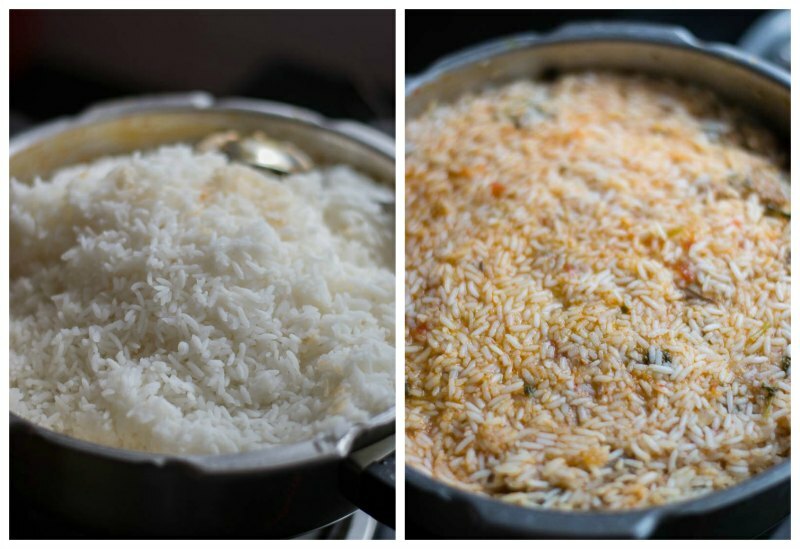 Its very difficult for me to give a time frame as the rice cooks differently according to the age of rice, amount of water added etc…The gauge for the texture of the rice for mutton biryani is that the rice at this stage should not be fully cooked. The center of the rice kernel should be still dry and raw. Drain the water and add the rice to the mutton pan. Mix well to combine. Now its ready for dum. Traditionally, dum is done using charcoal. But that’s not feasible at home. The substitute for dum cooking at home is to use an oven. Place the mutton biryani pan / vessel in a preheated 400 degree Fahrenheit oven for 30 minutes. If you don’t have an oven, heat a dosa pan on the stove and put the mutton biryani pan / vessel on top of the dosa pan and allow it to cook on low flame for 15 minutes. Put the whistle also along if you want the rice to be very soft. If you are putting the whistle, then do the dum only for 10 minutes. Let the pressure release naturally. Once the dum cooking is over, open the lid and gently fluff up the rice to mix. Serve mutton biryani hot with raita. Heat oil in a pan and add a table spoon of curd. Add in the Cinnamon, cloves and cardamom. Fry for 10 seconds. Add in the garlic paste. Fry for 2-3 minutes on medium flame. Bring a pot of water to a boil and add in the soaked rice. Add in the salt. Cook until the rice is half done. Drain the water and add the rice to the mutton pan. Mix well to combine. Place the mutton biryani pan / vessel in a preheated 400 degree Fahrenheit oven for 30 minutes. If you don’t have an oven, heat a dosa pan on the stove and put the mutton biryani pan / vessel on top of the dosa pan and allow it to cook on low flame for 15 minutes. Hi, should we double all the ingredients for 1kg of rice and mutton? The curry became too spicy.any tips to reduce the spice? Hi. This recipe turned out really good. Everyone liked it 😃. One question when I dropped 1 tbsp curd in oil , it was bursting and oil was splitting all over . It was too hard to put cloves and other masalas.. Any tips? Keep the flame in low or you can just omit the step. Can I use ambe mohar rice to cook this biryani? Yes. You can. The flabour of biriyani will differ thats all. Can we substitute mutton with chicken? If yes, what will be the ratio? 1:1? I tried this recepie it was good. I commented before trying this dish buy I don’t see it in the comments hmmmm. Anyway ur blog is good with all different dishes. The comment takes sometime to popup! I love all ur recipes, YOU are AWESOME . I tried this Ambur mutton briyani today. The taste came out good but 1.it became more watery ie not dry as you have showed, and 2.there was more aroma. Sorry this recipe did not work for you. This recipe has been tried by hundreds of people to stunning results. Just follow the recipe with the exact measurements as described and the biryani should be fine. I throughly enjoyed reading through this recipe, very detailed and well explained. I’m a beginner and your blog is my go-to for any recipe! I admire your passion for cooking! Can’t wait to try this recipe this weekend!! Do I have to keep the vessel in oven opened or covered with foil ? If doing in oven, cover with a foil. How many of water want to be added with half cooked rice + mutton mix, ma’am??? 1st you’ve added 500gm of mutton with 250 of ml of water..
You dont add any water at that stage Ambika. The mutton cooked liquid gravy is enough. We are just putting dum and the rice will get fully cooked with that minimal moisture. Hello Ms. Kannamma, Iam from Coimbatore and Biryani is my all time favorite. I like making various biriyanis for my family and keep trying various receipes. Our favorite restaurant is Star Biriyani. When i saw your this post, got delighted and tried it immediately. It turned out to be the most amazing biriyani i have ever made and both my husband and son has informed me not to make any other biriyani for sundays and to make only this biriyani. Thanks for the wonderful receipe. Will keep checking your other receipes. Thank you.. Thanks so much Jayanthi. Really glad that you guys liked it! Thanks for letting me know. Will take it up with them. Al your dishes are awesome…need brinjal sabji which is a side dish for briyani..kindly post..
Hi, I have posted Kathirikkai thokku and dalcha. Do check. Kannamma ……. U are awesome….people don’t worry if u don’t know how to cook….Kannama is there to save you. Feel like singing a nice melody for u. U are great like a sis telling step by step ways to cook. I love ur recipe. My hubby loves them a lot, even I have told him that its ur recipe. God bless u. Thank you so much Sumi. Your comment means a lot to me. Happy you liked it. Wish you and your family a very happy new year 2018! These recipes of yours are great. I am a Tamilian (from ooty, so not far from you) married to a white woman living in the States. My wife and I are foodies and we follow your site as well as on facebook… your recipes are great. especially for my wife who loves South Indian food and wants to learn to cook. its great for the advanced as well as the beginner… Thanks for sharing! write a book.. we will buy it! Thank you so much for your kind words. Made my day. Happy cooking to the both of you! Your recipes are awesome, have tried a few and they have been really yum. Thank you for sharing your interest and recipes with us. Hi Kannamma am a silent follower.I like your recipes i tried ur arisi paruppu sadam its really tastes yummy. Now here my doubt is if i keep in cooker for 1 cup seeraga samba rice how many cups water i should use. In thalapakatti biriyani u mentioned 1 cup=2 cups so plz clarify . Thalapakatti is not made in cooker. For cooker usually 1:1.5 water works good. You are an excellent cook as many said. I’m thinking to remake Julie&julia into me and kannamma?. Have tried some of your recipes so far, every attempt has marked to perfection. You are really ammmazing. I did a small variation in Ambur biryani instead of 50gms, i tried with 75gm ginger and it was exact star biryani. My guests loved it. Sorry i was silent spectator for your blog, couldn’t appreciate then n there.Thank you so much, Also to Sarasu attai for her wonderful recipe. Thank you so much for your kind words. It means a lot to me. Happy COoking! today I tried this recipe… taste was amazing.. but rice went sticky.. The main reason for rice turning sticky is because of not soaking the rice in water. The next could be the cooking time. If using cooker, do just for 2 whistles. We tried for this Sunday. It came out very well. Thank you so much for sharing this traditional recipe. Thank you. Glad you liked the recipe. Happy cooking! I am currently a forced bachelor…. as my wife had to stay away for work….. so u know I am have a get time in kitchen… not that I was not grt earlier…. It’s just that I have the kitchen for myself….. anyway…. your recipe mad my day and this weekend…. had my friend and his family for lunch…. and I believe they had a good lunch….. if not grt…. I can’t believe that I haven’t left a review yet. I stumbled upon your site about an year ago. The first time I made this was a hit. The only thing I have to do is follow it exactly as written…:-) Thak you!! Bamboo must impart a great flavour. Excellent recipe. 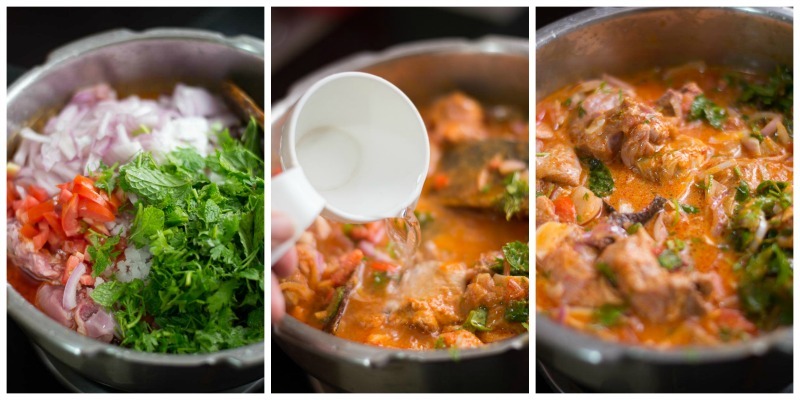 Detailed step by step procedure – easy to make and yummy to taste. Thanks for sharing the recipe. The aroma lasted for hours after cooking. So nice Priya. Glad to know that you like it. Hi Suguna, thank you for all your recipes! Your website is truly a life saver! I have a question – how do I make this without a pressure cooker? TIA! I have given the procedure for doing it in the oven in the recipe itself above. Please read. Mam sucha tasty recipe. Have tried this tdy n turned to be finger licking good. Again n again it tempted us to eat more especially wen hot;) awesome recipes ur sharing us really. Additionally hav used caramelised onion paste.yummy it comes out. Being in hospitality industry have tried lot of recipes from North India but have never made Biryani from South India. will surely make it. Sounds interesting. Sanjiv, mind sharing North Indian style briyani recipe? 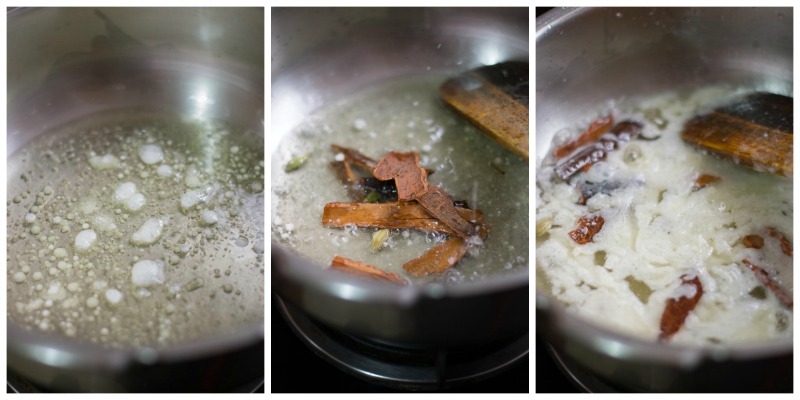 Fry the ginger garlic paste until the raw smell completely goes away. Not frying enough is the reason for the raw ginger taste. Shall I add briyani masala instead of red chilli paste??? No. They are not equal. Whats the variety of dry red chillies that can be used.. i used fudco dry long red chillies and they are very fiercefully spicy..
Do we use 50 gms of ginger and 50 gms of garlic and grind each of them to a paste?..or a lesser quantity?.. If you find the chillies to be very spicy , you can reduce the amount of chillies. This recipe uses 500 grams rice and mutton. Its almost 1 kg. So we do need that much ginger and garlic. Yes. we grind them to a paste and add. Hello Kannama, I have two questions for you. 1. Shall I paste the tomatoes in the mixie before adding them into the Masal? If so do I have to reduce the quantity? When the flesh of the tomato hits my tongue it tastes like tomato rice. Please suggest. 2. If I’m making Ambur style chicken biriyani do I have to tone down the Masal or shall I follow the same quantities of this recipe? 1. Yes. You can paste the tomatoes. No need to reduce the quantity. 2. You can follow the same recipe but reduce the meat cooking time. Thanks a lot for such detailed recipes. I’m cooking it for guests tomorrow along with your fried eggs recipe! Thank you. Happy cooking. Hope your guests and you have a great time! Could u pls mention the amount of rice in cups? Could you pls mention rice amount in terms of cup? 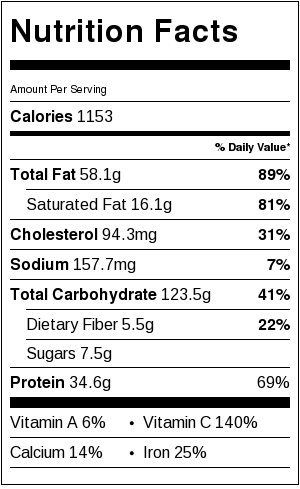 About 2 cups – approx 480 ml by volume. Thank you.It came out very well and tasted yummmm. I have not tried adding the soaked rice directly in the cooker. But I think it should work. Use 1 Rice: 1.5 liquid ratio if making in the cooker. I used 8 dried red chillies. No need to soak. Just grind with couple of tablespoon of water. Hi Hema, The red chilli paste is important for the color and has a slightly different flavor. Briyani came out fantastic. My family loved it. Thank u for posting this wonderful recipe. We really appreciate it. 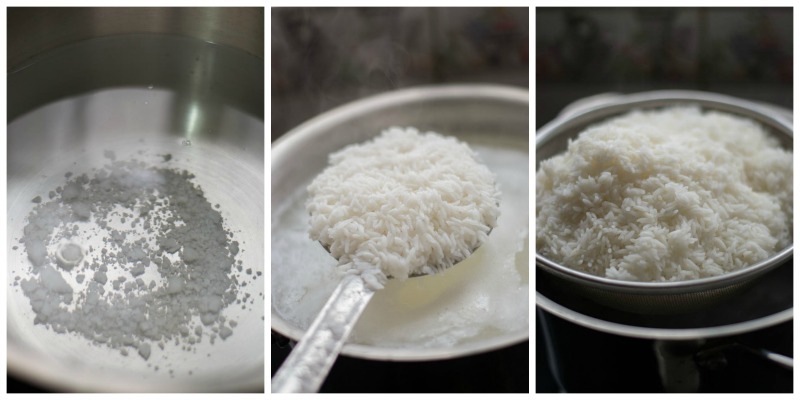 I have tried this recipe twice and both times i have messed up the last step – the cooking of rice. Both times the end result was soggy. I think I over cooked the rice both times. its been so annoying because till then the smell is great and it looks just like in your pictures. Is there any tip to get the rice right? Any help will be greatly appreciated. Its so frustrating to be so close yet so far. 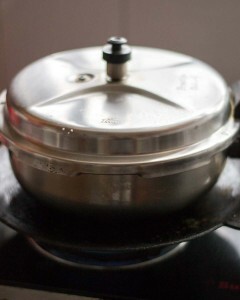 If you have a pressure cooker or a rice cooker then cook the rice with 3/4 cup of water for each cup of rice. Briefly soak rice for 15-20 minutes before cooking. Then proceed with the dum part. Hope this helps. If using pressure cooker 2 whistles and wait for pressure to release. I have started following your blog recently. All the recipes are yummy. Thank u. I m planning to try biriyani soon. I have one doubt. Can we cook the rice together wit the mutton,once it is cooked? cooking the rice separately and mixing will not mash the rice? We are not completely cooking the rice when we cook seperately. Only three fourth. The rice wont mash. Also mutton takes a long time to cook. So it has to be cooked separately. I tried this too, it was really an user friendly post. Kudos to the author. It came really well. My wife was like awwww & my parents like it too. Thank you guys. Thank you so much Ruby. It means a lot! WOW. How cool you are. Such a surprise it must have been for your family. Thank you so much Atmaram. Made it for the third time yesterday and it came out so well that my hubby was completely bowled over. 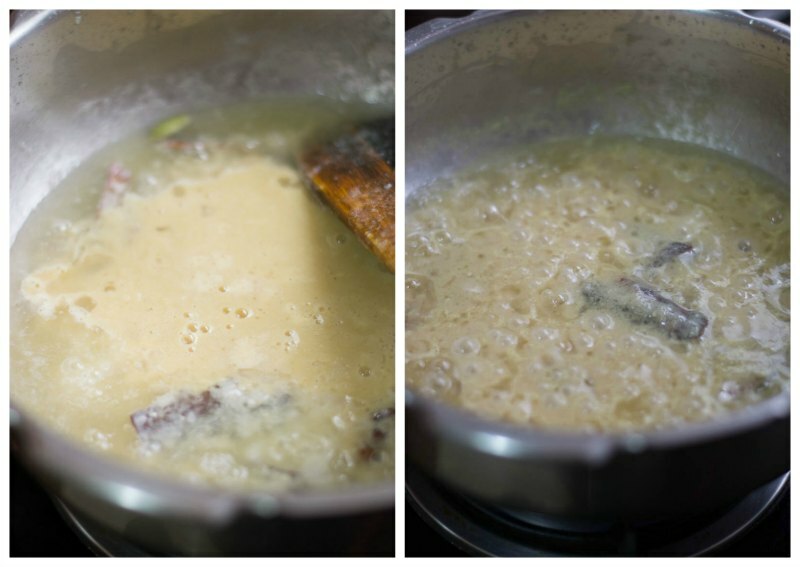 A fool proof recipe like your thalapakati’s. Thanks a ton for making cooking such a pleasure for us. Thanks so much Noreen! You made my day. Thats so nice of you to say Sunny Kris. Thank you so much. Is it typical ambur briyani? 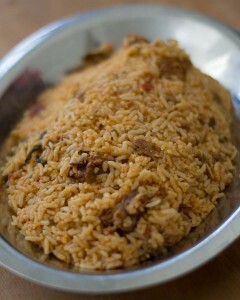 No need to do amy chsnges to get exact tastw of ambur briyani..Because i born nd brought up in ambur. I have tasted many times. I wish to try this recipes.. but fear if it not taste same as ambur briyani what to do then .. because all of my family members well experienced with ambur briyani taste.. 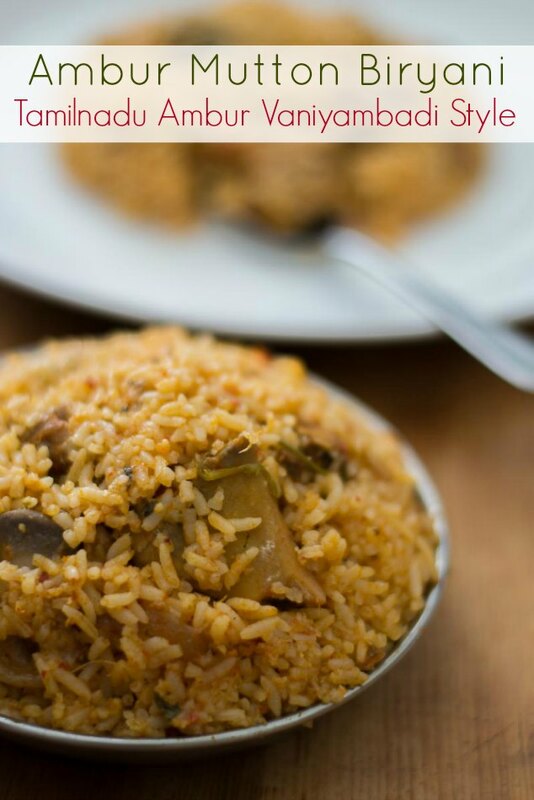 I am 17 yrs old and few days ago I wanted to impress my grandparents by just go ahead and make this biriyani… they were pretty much skeptical about how it would turn out but the outcome was pretty much bewildering for them cause was so delicious it made them gallop more…. plus it was my first time making biriyani! signing if from kuwait! Thats super awesome Melinda. So happy that your grand parents liked it. And you telling that you made biryani for the first time and with amazing success- makes my day! Happy cooking dear! Thank you so much for sharing this recipe. I am american and my boyfriend is from Vellore. He would tell me that as a child his family would take him to Ambur for Biryani on special occasions because it was only 20 minutes from his house. He would tell me that since living in the states he can never find a restaurant that makes Ambur biryani the correct way. I decided to surprise him and research what Ambur biryani was and what makes this biryani so different than other biryani. I came across your website and your recipe and decided to try it. I followed your recipe exactly the way you explained it. When my boyfriend came home to try it for the first time I think he went to heaven! He was so happy and could not stop telling me how much it tasted just like the biryani at ambur star hotel! Thank you so much again for sharing this recipe. Anytime I want to make him happy I make this for him. Thank you! madam, yesterday I tried this biriyani. It came out very well. My son was very happy about the taste & asked me to prepare more quantity on sunday. Thank you for sharing a good recipe. Thats really nice M.Jayalakshmi madam. Glad your son liked it. Thanks for writing in. You have to take a big pot with about 2 liters of water and boil the rice until its half cooked and then strain. Then add it to the biryani for dum. Can we use basmati rice instead? Sure. But seeragam samba is the traditional rice used. You can do with basmati too. Mam,I tried it today and it came out really very well…I loved it nd my hubby appreciated me a lot ..he too loved it..taste is totally different from other briyani…its been 3 years since I got married but I never gave a single try in making briyani but after I came across your blog I thought to try it and a very good output I got..thank you so much mam for sharing this wonderful recipe with us…I would like to try other recipes too from your blog..once again thanks mam..
btw FOR CHICKEN biriyani the recipe remains the same or any twists? You need not cook chicken in cooker for long time. the time will be the only difference. No need to soak the chillies. Just add a little water and make it to a paste. Regarding cooking in the oven, make sure the water in the vessel comes to a boil before getting it into the oven. You need to preheat the oven. Thanks for the recipe, I cooked & it was tasty, all the family members enjoyed it. 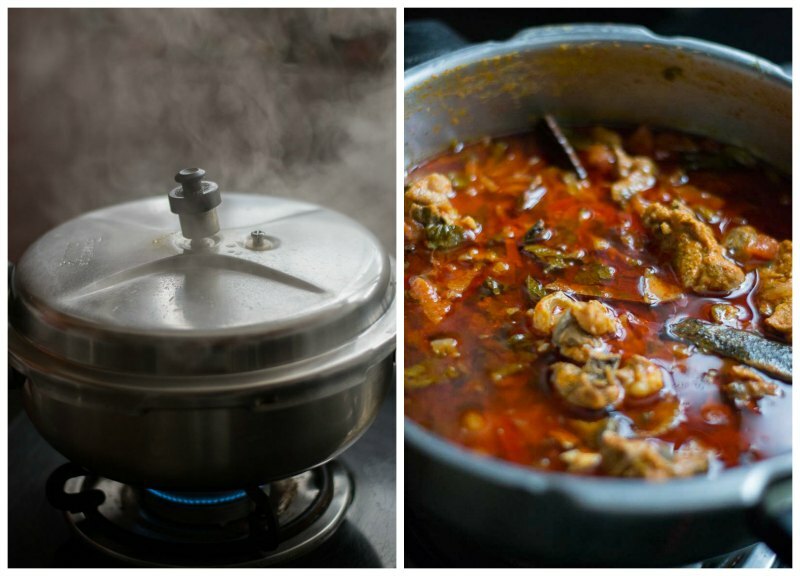 This recipe reminds me of my college days in chennai…. avadi where i used to live …..and .. i used to buy ambur chicken biryani and fried chicken leg pieces every sunday.. that was a weekend luxury for me ..please post recipe of chennai style chicken 65…thank you ..for reminding me those old days. Tried this one after being successfulwith dindugal thalapakatti biriyani! Came out quite well! The whole family enjoyed! Very good recepie. Made for the third time and it is perfect. Thank you! Third time charm! Thanks for sharing your recipe. Tried your recipe today and turn out to be delicious. My guest was surprised with the outcome. It’s very simple and less oil. Thanks. Thank you Vinoth. Glad that the mutton biryani turned delicious. Sure Sangeetha but just cook for 4 whistles only. I really appreciate ur efforts to bring out the original recipies to the fullest. I have gone through many blogs for Ambur and Thalapakkatti biriyani recipies and found only yours exactly matching with them by taste. Ur efforts are priceless n these thankyous are so small when compared to them. Thank you so much for your kind words Nisha. It means a lot to me. I am really glad that you like the recipes. Happy Cooking! Thank you so much Kaushik. Your comment made my day! Happy cooking! Hi kannamma,am bcumng a fan of ur recipes…I hv heard of ambur spcl briyani…but I hvn got a chnc to taste it…but nw I made tis on my own with ur instructions n finally I had it tasted…really the taste was so tempting n me n my husbnd enjyd each spoon of rice…I feel lyk am making wonders in my kitchen with ur recipes…it has becum a habit of luking into ur site daily fr any new dishes…thnk u fr all tat u presrnt us…. This really really means a lot to me. Looks like you are enjoying cooking! Hello ma’m. Original recipe. Neatly presented. Attention to detail in do’s & don’ts. Superb. Also, your website looks appealing compared to other cookery websites. I like your website and choice of recipes. Keep up the good work. Thank you so much Karthik. Your words really mean a lot. Thank you! Thank you Thahira. This one is for you. Rock on with your Panini Press! Will definitely post more Sandwich / Panini recipes. Had to thank you for this wonderful recipe ! Tried it and it was loved ! Thanks again for sharing ! Thank you Bharati. I am very happy to hear that your family liked Ambur Mutton Biryani recipe. This looks beautiful.. recently we watched a video from a Malayalam channel about Ambur Star Biryani. from that time I wanted to taste this delicious AMBUR MUTTON BIRYANI. Nice Job.. may god bless you…. Can we replace mutton with vegetables, would it taste the same ?. Any suggestion on the vegetables to use ?